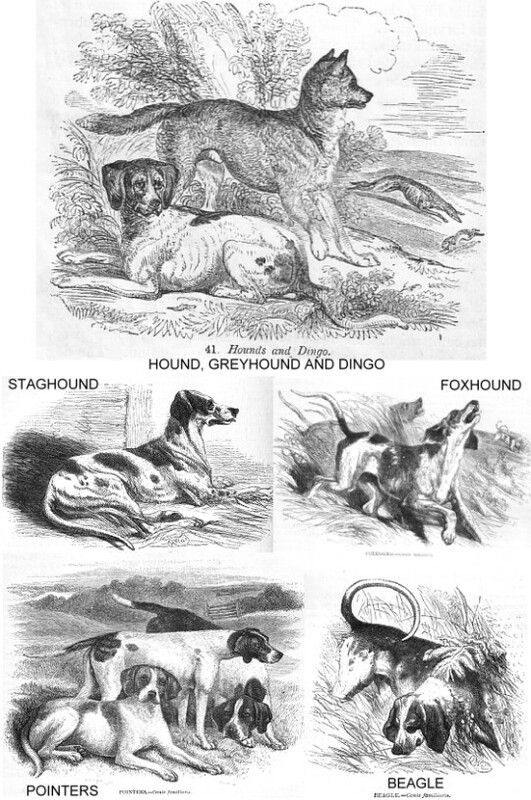 These pictures and accompanying descriptions are from the "Illustrated Natural History (Mammalia)" by Rev JG Wood, published in 1853 (my edition is the single volume Routledge 1874 edition) except for the "Hound, Greyhound and Dingo" woodcut from "Animals, their Nature and Their Uses" by Charles Baker, also in the 1850s. Closely allied with the bloodhound is the now rare STAGHOUND, a Dog which is supposed to derive its origin from the bloodhound and the greyhound, the latter animal being employed in order to add lightness and speed to the exquisite scent and powerful limbs of the former. Sometimes the foxhound is used to cross with this animal. It is a large and powerful Dog, possessed of very great capabilities of scent, and able, like the bloodhound, to hold to the trail on which it is laid, and to distinguish it among the footprints of a crowd. Despite of the infusion of greyhound blood, the Staghound is hardly so swift an animal as might be conjectured from its proportions, and probably on account of its slow pace has fallen into comparative disrepute at the present day. Until the death of George III. the stag-chase was greatly in vogue; but since that time it has failed to attract the attention of the sporting world, and has gradually yielded to the greater charms of the foxhunt. The real old English Staghound is now extremely rare, and is in danger of becoming entirely extinct. The Dog which is now used for the purpose of chasing the stag is simply a very large breed of the foxhound, which, on account of its superior length of limb, is more capable of matching itself against the swift-footed deer than the ordinary hound. These Dogs are very powerful when in a good state of health, and have been known to achieve very wonderful feats of speed and endurance. They have been known to run for a distance of fifty miles in pursuit of a stag; and one memorable run is recorded, where the stag, and the only two hounds which kept to its trail, were found dead close to each other. The stag bad made one powerful effort, had leaped over a park wall, which the Dogs in their wearied state were unable to surmount, and had fallen dead just as it had gained a place of safety. It is needful that the Staghound should be a courageous as well as a powerful animal; for when the stag is brought to bay it becomes a formidable antagonist […]. Of all the Dogs, which are known by the common title Of “hound,” the FOXHOUND is the best known[…] It is supposed that the modern Foxhound derives its origin from the old English hound, and its various points of perfection from judicious crosses with other breeds. For example, in order to increase its speed, the greyhound is made to take part in its pedigree, and the greyhound having already some admixture of the bull-dog blood, there is an infusion of stubbornness as well as of mere speed. 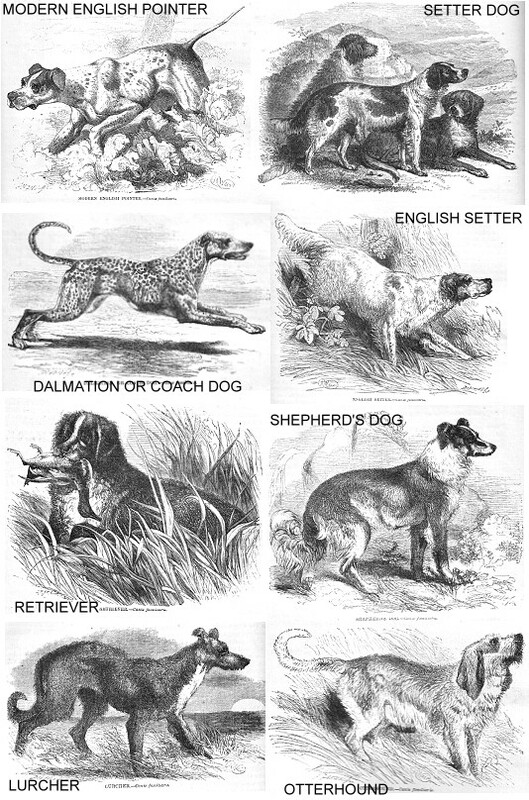 There are various breeds of dog which are remarkable for the very great development of some peculiar faculty, such as speed in the greyhound, courage in the bull-dog, delicacy of scent in the bloodhound, sagacity in the poodle, and so on. So that, when a breed of dog begins to fail in any of these characteristics, the fault is amended by the introduction of a dog belonging to the breed which exhibits the needful quality in greatest perfection. It is remarkable that the mental character is transmitted through a longer series of descendents that the outward form. Even in the case of such widely different Dogs as the bull-dog and the greyhound, all vestige of the bull-dog form is lost in the fourth cross, while the determinate courage of the animal is persistent, and serves to invigorate the character of unnumbered progressive progeny. By using these means with the greatest care and judgment, the modern sportsmen have succeeded in obtaining an animal which is so accurate of scent, that it might almost challenge the bloodhound himself in its power of discovering it, and of adhering to it when found; so determined in character, that it has many a time been known to persevere in its chase until it has fallen dead on the track. According to the latest authorities, the best average height for Foxhounds is from twenty-one to twenty-five inches, the, female being generally smaller than the male. However, the size of the Dog does not matter so much; but it is expected to match the rest of the pack in height as well as in general appearance. […] In its natural state, the head of the Foxhound has a different aspect from that which is presented by the trained Dog. This change of appearance is caused by the custom of cropping,. or rather of trimming, the ears, so as to dock them of their full proportions, and to leave no more of the external organ than is necessary to protect the orifice. ‘It is said that this process is necessary, in order to guard the animal’s ears from being torn by the brambles and other thorny impediments which constantly come in its path, and through which the Dog is continually forced to thrust itself. But the custom does not seem to confer a corresponding benefit on the poor creature whose ears are subjected to the operator’s steel, and it may be that the custom of cropping Dogs’ ears will go out of fashion, as is happily the case with the equally cruel practice of cropping the ears of horses, and docking their tails. There are several breeds of the BEAGLE, which are distinguishable from each other by their size and general aspect. The Medium-sized Beagle is not unlike the harrier, but is heavier about the throat than that animal and has stouter limbs, and a comparatively larger body. The height of this dog is from a foot to fourteen or fifteen inches. The Rough Beagle is thought to be produced by crossing the original stock with the Rough Terrier and possesses the squeaking bark of the terrier rather than the prolonged musical intonation of the Beagle. Some authorities, however, take the animal to be a distinct variety. The nose of this creature is furnished with the stiff whisker-hairs which are found on the muzzle of the rough terrier, and the fur is neatly as stiff and. wiry as the terrier’s. The Dwarf Beagle or Rabbit Beagle, as it is sometimes called, is the smallest of the three animals, delicate in form and aspect, but good of nose and swift of foot. So very small are some of these little creatures that a whole pack has been conveyed to and from the field in hampers slung over the back of a horse, or simply in the shooting pockets of the men. […] Ten inches is the average height of a Rabbit Beagle. This little group of Dogs is representative of two breeds of the POINTER, the two foremost Dogs being examples of the modern English Pointer, and the third, of the Spanish Pointer. The latter of these Dogs is now seldom used in the field, as it is too slow and heavily built an animal for the present fast style of sporting, which makes the Dogs do all the ranging, and leaves to their master but a comparatively small amount of distance to pass over. The nose of this Dog is peculiarly delicate, as may be inferred from its exceedingly wide muzzle, and for those sportsmen who cannot walk fast or far, it is an useful assistant. As may be seen from the engraving, the modern English Pointer is a very different animal, built on a much lighter model, and altogether with a more bold and dashing air about it. While it possesses a sufficiently wide muzzle to permit the development of the olfactory nerves, its limbs are so light and wiry that it can match almost any Dog in speed. Indeed, some of these animals are known to equal a slow greyhound in point of swiftness. […]According to “Stonehenge,” the marks of a good Pointer are as follows. “A moderately large head, wide rather than long, with a high forehead and an intelligent eye, of medium size. Muzzle broad, with its outline square in front, not receding as in the hound. Flews (i.e. the overhanging lips) manifestly present, but not pendent. The head should be well set on the neck, with a peculiar form at the junction only seen in the Pointer. The neck itself should be long, convex in its upper outline, without any tendency to a dewlap or a ruff as the loose skin covered with long hair round the neck is called. The body is of good length, with a strong loin, wide hips, and rather arched ribs, the chest being well let down, but not in a hatchet shape as in the greyhound, and the depth in the back ribs being proportionably greater than in that Dog. The tail, or ‘stern,’ as it is technically called, is strong at the root, but, suddenly diminishing, it becomes very fine, and then continues nearly of the same size to within two inches of the tip, where it goes off to a point, looking as sharp as the sting of a wasp, and giving the whole very much the appearance of that’ part of the insect, but magnified as a matter of course. This peculiar shape of the stern characterizes the breed, and its absence shows a cross with the hound or some other Dog.” The author then proceeds to recommend long, slanting, but muscular shoulder-blades, a long upper arm, a very low elbow, and a short fore-arm. The feet must be round and strong, and padded with a thick sole, the knee strong, and the ankle of full size. The colour is of comparatively small importance, but ought, if. possible, to be white, so that the animal may be visible while beating among heather, clover, or turnips. Black or liver-coloured dogs are very handsome to the eye, but often cause much trouble to the sportsman, on account of the difficulty of distinguishing them among the herbage. White Dogs, with lemon-coloured heads, are the favourites of this author. As the pointers derive their name from their habits of standing still and pointing at any game which they may discover, so the SETTERS have earned their title from their custom of “setting” or crouching when they perceive their game. In the olden days of sporting, the Setter used always to drop as soon as it found the game, but at the present day the animal is in so far the imitator of the pointer, that it remains erect while marking down its game. 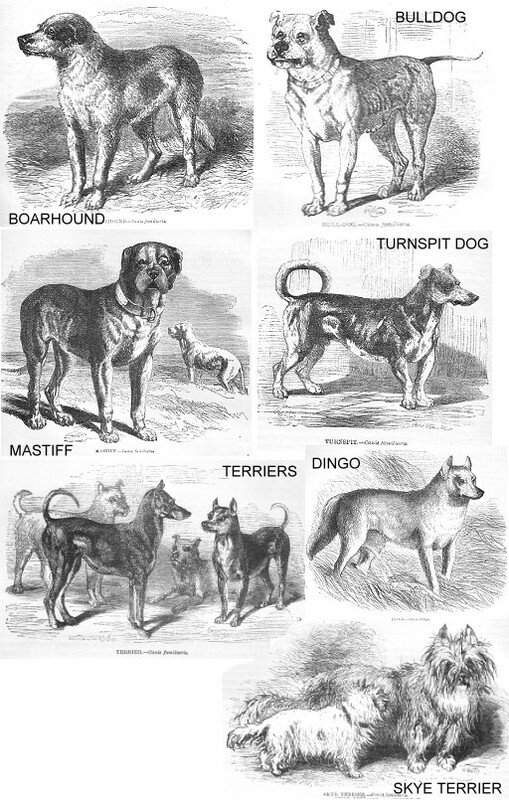 There are several breeds of these animals, three of which are represented in the engraving. The Dog which occupies the foreground is an ordinary English Setter, the seated Dog towards the back is a Russian Setter, and the reclining Dog is an Irish Setter. Each of these breeds possesses its particular excellences, which are combined in experienced and skilful, hands by careful admixtures of one breed with another. The RUSSIAN SETTER is a curious animal in appearance, the fur being so long and woolly in texture, and so thoroughly matted together, that the form of the Dog is rendered quite indistinct. It is by no means a common animal, and is but seldom seen. It is an admirable worker, quartering its ground very closely, seldom starting game without first marking them; and possessed of a singularly delicate nose. In spite of its heavy coat, it bears heat as well as the lighter-clad pointer, and better than the ordinary English Setters, with their curly locks. When crossed with the English Setter it produces a mixed breed, which seems to be as near perfection as can be expected in a dog, and which unites the good properties of both parents. The muzzle of [the Russian Setter] is bearded almost as much as that of the deerhound and the Scotch terrier, and the overhanging hair about the eyes gives it a look of self-relying intelligence that is very suggestive of the expression of a Skye terrier’s countenance. The soles of the feet are well covered with hair, so that the Dog is able to bear plenty of hard work among heather or other rough substances. The IRISH SETTER is very similar to the English animal, but has larger legs in proportion to the size of the body, and is distinguished from its English relative by a certain Hibernian air that characterises it, and which, although conspicuous enough to a practised eye, is not easy of description. […] the points of the Setter are shortly as follows:- A moderately heavy head, but not so much so as in the pointer; the muzzle not so broad nor so square in profile, the lower angle being rounded off, but the upper being still nearly a right angle. The eye is similar to that of the pointer, but not so soft, being more sparkling and full of. spirit. The ear long, but thin, and covered with soft, silky hair, slightly waved. The neck is long, but straighter than that of the pointer, being also lighter and very flexible. The back and loins are hardly so strong as those of the pointer, the latter also being rather longer; the hips also are more ragged, and the ribs not so round and barrel-like. The tail or ‘flag’ is usually set on a little lower, is furnished with a fan-like brush of long hair, and is slightly curled upwards towards the tip, but it should never be carried over the back or raised above the level of its root, excepting while standing, and then a slight elevation is admired, every hair standing down with a stiff and regular appearance. The elbow, when in perfection, is placed so low as to be fully an inch below the brisket, making the fore-arm appear very short. The hind-feet and legs are clothed with hair, or ‘feathered,’ as it is called, in the same way as the fore-legs, and the amount of this beautiful provision is taken into consideration in selecting the Dog for his points.” This description applies equally to the English and the Irish Setters. The DALMATIAN DOG is even better known as a carriage or coach Dog than the Danish Dog, which has already been described and figured. Its shape is very like that of the pointer, but the artificially shortened ears give it a different aspect. The ground colour of ‘this animal’s fur is nearly white, and is richly crossed with black spots, earning for it, in common with the Danish Dog, the title of “Plum-pudding.” The height of this animal is about twenty-four or twenty-five inches. Some years ago, the Dalmatian Dog was very frequently seen in attendance upon the Carriage of its owner, scampering along in high glee by the side of the vehicle, or running just in front of the horses, apparently in imminent danger of being knocked over every moment, Now, however, the creature, has lost its hold on the fashionable world, and is but seldom seen. RETRIEVER DOGS, which axe so called on account of their value in recovering or “retrieving” game that has fallen out of the reach of the sportsman, or on which he does not choose to expend the labour of fetching for himself, are of various kinds, and in every case are obtained by a crossing of two breeds. There are two principal breeds of retrjevers, the one being obtained by the mixture of a Newfoundland Dog and a setter, and the other by a cross between the water spaniel and the terrier. The former of these breeds is the most generally known, and is the animal which is represented in the engraving. On inspection of this Dog, the characteristics of both parents are plainly perceptible in its form. For the larger kinds of game, such as hares or pheasants, this Dog is preferable to the Terrier Retriever, as it is a more powerful animal, and therefore better able to carry its burden; but, for the lesser description of game, the smaller Dog is preferable for many reasons. The height of the large Retriever is from twenty-two to twenty-four inches; its frame is powerfully built, and its limbs strong. A good nose is necessary, for the purpose of enabling the Dog to trace the devious and manifold windings of the wounded birds, which would baffle any animal not endowed with so exquisite a sense of smell. The fur of this Dog is curly and of moderate length, and is almost invariably black in colour. Indeed, many Dog-owners will repudiate a Retriever of any other colour but black. The amaller Retriever~ is produced by a cross of the terrier with the beagle, and in many points is superior to the large black Retriever. Should a larger animal be required, the pointer is employed in the cross instead of the beagle. They are very quiet dogs, and when on their quest do not make so much noise as the larger Retrievers, so that they are especially useful when the game is wild. The kind of terrier which is employed in the crossing depends on the caprice of the breeder, some persons preferring the smooth English Dog, and others the rough Scotch terrier. [SHEEPDOG] The most useful variety of the canine species is that sagacious creature on whose talent and energy depends the chief safety of the flock. This animal seems to be, as far as can be judged from appearances, the original ancestor of the true British Dogs; and preserves its peculiar aspect in almost every country in Europe. It is a rather large Dog, as is necessary, in order to enable the animal to undergo the incessant labour which it is called on to perform, and is possessed of limbs sufficiently large and powerful to enable it to outrun the truant members of the flock, who, if bred on the mountain-side, are so swift and agile that they would readily baffle the efforts of any Dog less admirably fitted by nature for the task of keeping them together. As the Sheep-dog is constantly exposed to the weather, it needs the protection of very thick and closely-set fur, which, in this Dog, is rather woolly in its character, and is especially heavy about the neck and breast. The tail of the Sheep-dog is naturally long and bushy, but is generally removed in early youth, on account of the now obsolete laws, which refused to acknowledge any Dog as a Sheep-dog, or to exempt it from the payment of a tax, unless it were deprived of its tail. This law, however, often defeated its own object, for many persons who liked the sport of coursing, and cared little for appearances, used to cut off the tails of their greyhounds, and evade the tax by describing them as Sheep-dogs. The muzzle of this Dog is sharp, its head is of moderate size, its eyes are very bright and intelligent, as might be expected in an animal of so much sagacity and ready resource in time of need. Its feet are strongly made, and sufficiently well protected to endure severe work among the harsh stems of the heather on the hills, or the sharply-cutting stones of the highroad. Probably on account of its constant exercise in the open air, and the hardy manner in which it is brought up, the Sheep-dog is perhaps the most untiring of our domesticated animals. The SCOTCH SHEEP-DOG, more familiarly called the COLLEY, is not unlike the English Sheep-dog in character, though it rather differs from that animal in form. It is sharp of nose, bright and mild of eye, and most sagacious of aspect. Its body is heavily covered with long and woolly hair, which stands boldly out from its body, and forms a most effectual screen against the heat of the blazing sun, or the cold, sleety blasts of the winter winds. The tail is exceedingly bushy, and curves upwards towards the end, so as to carry the long hairs free from the ground. The colour of the fur is always dark, and is sometimes variegated with a very little white. The most approved tint is black and tan; but it sometimes happens that the entire coat is of one of these colours, and in that case the Dog is not so highly valued. The “dew-claws” of the English and Scotch Sheep-dogs are generally double, and are not attached to the bone, as is the case with the other claws. At the present day it is the custom to remove these appendages, on the grounds that they are of no use to the Dog, and that they are apt to be rudely torn off by the various obstacles through which the animal is obliged to force its way, or by the many accidents to which it is liable in its laborious vocation In the entire aspect of this creature there is a curious resemblance to the Dingo, as may be seen on reference to the account of that animal in a subsequent page. The DROVER’S DOG is generally produced from the sheep-dog and the mastiff or foxhound, and sometimes from the sheep-dog and the greyhound or pointer; the peculiar mixtures being employed to suit the different localities in which the Dog is intended to exercise its powers. In some places the Drover’s Dog is comparatively small, because the sheep are small, docile, and not very active. But when the sheep are large, agile, and vigorous, and can run over a large extent of ground, a much larger and more powerful animal is needed, in order to cope with the extended powers of the sheep which are committed to its guardianship. Although the Drover’s Dog may be entrusted with the entire charge of the flock, its rightful vocation is the conveyance of the sheep from place to place. The true CUR DOG is produced from the sheep-dog and the terrier, and is a most useful animal to the class of persons among whom it is generally found. It is rather apt to be petulant in its temper, and is singularly suspicious of strangers; so that although it is rather an unpleasant neighbour by reason of its perpetually noisy tongue, it is of the greatest service to the person to whom it belongs. It is an admirable house-dog, and specially honest, being capable of restraining its natural instincts, and of guarding its owner’s provisions, even though it may be almost perishing with hunger. The Cur is the acknowledged pest of the passing traveller, especially if he be mounted, or is driving, as it rushes out of its house at the sound of the strange footstep, and follows the supposed intruder with yelps and snaps until it flatters itself that it has completely put the enemy to flight. About the house the Cur is as useful as is the Colley among the hills, for it is as ready to comprehend and execute the wishes of its master at home as is the sheep-dog on the hills. […] The Cur Dog has - as all animals have - its little defects. It is sadly given to poaching on its own account, and is very destructive to the young game. It is too fond of provoking a combat with any strange Dog, and if its antagonist should move away, as is generally the case with high-bred Dogs, when they feel themselves intruding upon territories not their own, takes advantage of the supposed pusillanimity of the stranger, and annoys him to the best of its power; but if the stranger should not feel inclined to brook such treatment, and should turn upon its persecutor, the Cur is rather apt to invoke discretion instead of valour, and to seek the shelter of its own home, from whence it launches its angry yelpings as if it would. tear its throat in pieces. Possessing many of the elements of the sheep-dog, but employed for different purposes, the LURCHER has fallen into great disrepute, being seldom seen as the companion of respectable persons. It is bred from the greyhound and sheep-dog, and is supposed to be most valuable when its parents are the rough Scotch Greyhound and the Scotch Colley. It is a matter of some regret that the Dog should bear so bad a character, as it is a remarkably handsome animal, combining the best attributes of both parents, and being equally eminent in speed, scent, and intelligence. As, however, it is usually the companion of poachers and other disreputable characters, the gamekeeper bears a deadly hatred towards the Lurcher, and is sure to shoot the poor animal at the earliest opportunity. […] Sometimes the game-destroying instincts of the Lurcher take a wrong turn, and lead the animal to hunt sheep, instead of confining itself to ordinary game. When it becomes thus perverted it is a most dangerous foe to the flocks, and commits sad havoc among them. […] There are many breeds of the Lurcher, on account of the various Dogs of which the parentage is formed. The greyhound and sheep-dog are the original progenitors, but their offspring is crossed with various other Dogs, in order to obtain the desired qualifications. Thus, the greyhound is used on account of its speedy foot and silent tongue, and the sheep-dog on account of its hardiness, its sagacity, and its readiness in obeying its master. The spaniel is often made to take part in the pedigree, in order to give its well-known predilection for questing game, and the hound is employed for a similar purpose. But in all these crossings the greyhound must morally predominate, although its form is barely to be traced under the rough linearnents of the Lurcher. As the Lurcher causes such suspicion in the minds of the gamekeeper or the landlord, the owners of these Dogs were accustomed to cut off their tails, in order to make them look like honourable sheep-dogs, and so to escape the tax which presses upon sporting Dogs […] it can take upon itself that character in reality which its cropped tail too often falsely indicates, and can watch a fold, keep the sheep in order, or conduct them from one place to another, nearly if not quite as well as the true sheep-dog from which it sprang. The OTTERHOUND is now almost exclusively employed for the chase of the animal from which it derives its name. Formerly it was largely used in Wales for the purpose of hunting the hare, and from that pursuit has derived the name of “Welsh Harrier.” It is a bold, hardy, and active animal, as is needful for any Dog which engages in the chase of so fierce and hard-biting a creature as the otter. As it is forced to take to the water in search or in chase of its prey, it is necessarily endowed with great powers of swimming […] Great courage is needful on the part of the dog because the otter is, when irritated, a peculiarly fierce animal, and can inflict most painful wounds by the bite of its long sharp teeth. It is, moreover, so pliant of body that it can twist itself about almost like a snake, and, if grasped heedlessly, can writhe itself about as actively and slipperily as an eel, and unexpectedly plant its teeth in its antagonist’s nose. Now, the nose is a very sensitive portion of all animal economy, and a wound or a bite in that region causes such exceeding pain that none but a well-bred Dog can endure the torture without flinching. Such needful courage is found in the Otter Dog, but is sometimes rather prone to degenerate into needless ferocity. There are few animals, with the exception of the bull-dog, which fight so savagely as the Otterhound, or bite so fiercely and with such terrible results. The attack of the Otterhound is even more dangerous than that of the bull-dog, and its bite more to be dreaded. As is well known, where the bull-dog has once fixed his teeth there he hangs, and cannot be forced to loosen his hold without the greatest difficulty; but when the Otterhound bites, it instantly tears its teeth away without relaxing its jaws. and immediately seizes its prey with a second gripe. The wounds which it inflicts by this ferocious mode of action are of the most terrible description, lacerating all the tissues, and tearing asunder the largest and most important vessels. The reason for this very savage mode of attack is evident enough. The otter is so quick and agile, that, if the Dog were to retain his hold, the otter would twist round and inflict a severe bite, so the Dog bites as fast and as often as he can, in order to give his antagonist the fewest possible chances of retaliation. When a number of these Dogs are placed in the same kennel they are sadly apt to fight, and to inflict fatal injuries on each other from the sheer love of combat. If two of the Dogs begin to quarrel and to fight, the others are sure to join them; so that, from the bad temper of a single Dog, half the pack may lose their lives. As these Dogs are obliged to endure the most turbulent weather and the coldest streams, they are furnished with a very strong, rough, and wiry coat, which is capable of resisting the effects of cold and storm, and is also of much service in blunting the severity of the otter’s bite. The face and muzzle are guarded with a profusion of longish and very rough “whisker” hairs. Whether this animal is the production of a cross breed between two families of Dogs, or whether it forms a distinct family in itself, is a mooted point. According to the best authorities, the latter opinion seems to be the best founded. It is thought by those who consider the Dog to be of mixed breed, that it was originally the offspring of the deer-hound and terrier; but as it retains the full melodious note of the hound, which is always injured or destroyed by an admixture with the sharp-voiced terrier, it appears to owe more of its parentage to that animal. Be this as it may, it is now treated as a separate breed, and may claim the honours of a pure lineage. In all probability it is a variety of the old southern hound, which was selected carefully for the work which it is intended to perform, and which in course of time has so settled down to its vocation as to have undergone that curious variation in form and aspect that is always found in animals or men which have long been employed in the same kind of work. The Otterhound is a tolerably large Dog, measuring nearly two feet in. height at the shoulder. This is the height of the male, that of the female is an inch or two less. [BOARHOUND] The fine animal which is represented in. the accompanying engraving can hardly be considered as belonging to a separate breed, but rather as a mixture between several families of domesticated Dogs. According to competent judges, the BOARHOUND is derived from a mingling of the mastiff with the greyhound, crossed afterwards with the terrier. The reader will see why these three animals are employed for the purpose of obtaining a Dog which is capable of successful attack on so dangerous and powerful a brute as the boar. The greyhound element is required in order to give the Dog sufficient speed for overtaking the boar, which is a much swifter animal than would be supposed from his apparently unwieldy and heavy frame. The admixture of the mastiff is needed to give it the requisite muscular power and dimensions of body, and the terrier element is introduced for the sake of obtaining a sensitive nose, and a quick, spirited action. As might be imagined would be the case with an animal which derives its origin from these sources, the Boarhound varies very considerably in form and habits, according to the element which may preponderate in the individual. A Dog in which the greyhound nature is dominant will be remarkably long of limb and swift of foot; one in whose parentage the mastiff takes the greatest share will be proportionately large and powerful; while the Dog in whose blood is the strongest infusion of the terrier will not be so swift or so large as the other two, but will excel them in its power of scent and its brisk activity of movement. To train the Dog rightly to his work is a matter of some difficulty, because a mistake is generally fatal, and puts an end to further instruction by the death of the pupil. It is comparatively easy to train a pointer or a retriever, because, if he fails in his task through over-eagerness or over-tardiness, the worst consequence is, that the sportsman loses his next shot or two, and the Dog is corrected for his behaviour. But if a Boarhound rushes too eagerly at the bristly quarry, he will in all probability be laid bleeding on the ground by a rapid stroke from the boar’s tusks, and if he should hang back and decline the combat, he is just as likely to be struck by an infuriated boar as if he were boldly attacking it in front. A boar has been known to turn with such terrible effect upon a pack containing fifty Dogs, that only ten escaped scathless. and six or seven were killed on the spot. Great tact is required on the part of the hound in getting into a proper position, so as to make his onset without exposing himself to the retaliating sweeps of the foam-flecked tusks, and at the same time to act in concert with his companions, so as to keep the animal busily engaged with their reiterated attacks, while their master delivers the death blow with a spear or rifle-bullet. As we have no longer any wild boars ranging at will through the few forests which the advance of agriculture has suffered to remain as relics of a past age, the Boarhound is never seen in this country except as an object for the curious to gaze upon, or imported into this island through the caprice of some Dog-loving individual. But in many parts of Germany it is still employed in its legitimate avocation of chasing the wild boar, and is used in Denmark and Norway for the pursuit of that noble animal the elk [US: moose]. The latter creature is so large, so fleet, and so vigorous, that it would easily outrun or outfight any Dog less swift or less powerful than the Boarhound. In the fur of the Boarhound the colour of the mastiff generally predominates, the coat being usually brown or brindled uniformly over the body and limbs, but in some animals the colour is rather more varied, with large brown patches upon a slate-coloured ground. The limbs are long and exceedingly powerful, and the head possesses the square muzzle of the mastiff, together with the sharp and somewhat pert air of the terrier. It is a very large animal, measuring from thirty to thirty-two inches in height at the shoulder. The MASTIFF, which is the largest and most powerful of the indigenous English Dogs, is of a singularly mild and placid temper, seeming to delight in employing its great powers in affording protection to the weak, whether they be men or Dogs. It is averse to inflicting an injury upon a smaller animal, even when it has been sorely provoked, and either looks down upon its puny tormentor with sovereign disdain, or inflicts just sufficient punishment to indicate the vast strength which it could employ, but which it would not condescend to waste upon so insignificant a foe. Yet, with all this nobility of its gentle nature, it is a most determined and courageous animal in fight, and, when defending its master or his property, becomes a foe which few opponents would like to face. These qualifications of mingled courage and gentleness adapt it especially for the service of watch-dog […] Sometimes the bull-dog strain is mixed with the Mastiff; in order to add a more stubborn courage to the animal; but in the eyes of good judges this admixture is quite unnecessary. […] The head of the Mastiff bears a certain similitude to that of the bloodhound and the bull-dog, possessing the pendent lips and squared muzzle of the bloodhound, with the heavy muscular development of’ the bull-dog. The under-jaw sometimes protrudes a little, but the teeth are not left uncovered by the upper lip, as is the case with the latter animal. The fur of the Mastiff is always smooth, and its colour varies between a uniform reddish-fawn and different brindlings and patches of dark and white. The voice is peculiarly deep and mellow. The height of this animal is generally from twenty-five to twenty-eight inches, but sometimes exceeds these dimensions. One of these Dogs was no less than thirty-three inches in height at the shoulder, measured fifty inches round his body, and weighed a hundred and seventy-five pounds. The CUBAN MASTIFF is supposed to be produced by a mixture of the true Mastiff with the bloodhound and was used for the same purpose as the latter animal It was not a native of the country where its services were brought into requisition, and from which it has consequently derived its name, but was imported there for the purposes of its owners, being taught to chase men instead of deer. This Dog was employed with terrible success in the invasion of America by the Spaniards, and was, in the eyes of the simple natives, a veritably incarnated spirit of evil, of which they had never seen the like, and which was a fit companion to those fearful apparitions which could separate themselves into two distinct beings at will, one with four legs and the other with two, and destroy them at a distance with fiery missiles, against which they were as defenceless as against the lightning from above. Even in more recent times, the services of these Dogs have been rendered available against the rebel forces of Jamaica, when they rose against the Government, and but for the able assistance of these fierce and sagacious animals, would apparently have swept off the European inhabitants of the island. The TERRIER, with all its numerous variations of crossed and mongrel breeds, is more generally known in England than any other kind of Dog. Of the recognised breeds, four are generally acknowledged; namely, the English and Scotch Terriers, the Skye, and the little Toy Terrier, which will be described in their order. The ENGLISH TERRIER possesses a smooth coat, a tapering muzzle, a high forehead, a bright intelligent eye, and a strong muscular jaw. As its instinct leads it to dig in the ground, its shoulders and fore-legs are well developed, and it is able to make quite a deep burrow in a marvelously short time, throwing out the loose earth with its feet, and dragging away the stones and other large substances in its mouth. It is not a large Dog, seldom weighing more than ten pounds, and often hardly exceeding the moiety of that weight. Although a light, quick and lively creature, and fuming with anxiety at the sight or smell of the animals which are popularly termed “vermin,” the pure English Terrier will seldom venture to attack a rat openly, although it will be of the greatest service in discovering and unharbouring that mischievous rodent. The sport which this Dog preferred is, that itself should startle the rats, while its master destroys them. If a rat should fasten upon this Dog, he will yelp and cry piteously, and, when relieved from his antagonist, will make the best of his way from the spot; or if the rat should turn to bay, the dog will usually scamper off and decline the combat. The celebrated rat-killing Terriers. of whose feats so much has been said, were all indebted for their valour to an infusion of the bull-dog blood, which gives the requisite courage without detracting from the shape of the Dog, or adding too much to its size. Of these bull-terrier Dogs, more will be said in their place. The colour of the pure English Terrier is generally black and tan, the richness of the two tints determining much of the animal’s value. The nose and the palate of the Dog ought to be always black, and over each eye is a small patch of tan colour. The tail ought to be rather long and very fine, and the legs as light as is consistent with strength. There is a peculiar breed of the Scotch Terrier which is called the DANDIE DINMONT, in honour of the character of that name in Scott’s “Guy Mannering.” These Dogs are of two colours; one a light brown with a reddish tinge, termed “mustard,” and the other a bluish-grey on the body and tan on the legs, denominated “pepper.” These little animals are very courageous; although they often exhibit no proofs of their bold nature until they have passed the age of two years, appearing until that time to be rather cowardly than otherwise. This conduct is supposed to be occasioned by their gentle and affectionate disposition. The legs of this variety of Terrier are short in proportion to the length of the body, the hair is wiry and abundant, and the ears are large, hanging closely over the sides of the head. The BULL-TERRIER unites in itself the best qualifications of the sporting Dogs, being very intelligent, apt at learning, delicate of nose, quick of eye, and of indomitable courage. In size it is extremely variable, some specimens being among the smallest of the canine tribes, while others measure as much as twenty inches in height. In this Dog it is quite unnecessary to have equal parts of the bull-dog and the Terrier; for in that case the progeny is sure to be too heavily made about the head and jaws, and not sufficiently docile to pay instant and implicit obedience to the commands of its master. Until these points are removed, the Terrier cross should be continued, so as to restore the light, active form of the Terrier, together with its habit of ready obedience, while the courageous disposition remains. Indeed, the most ferocious Dogs, and the hardest fighters, are generally the immediate offspring of the bull-dog and Terrier, and are often erroneously- described under the name of the former animal. How the external form of the bull-dog can be eradicated, while its dauntless courage remains intact, is shown in the graceful little Terriers which are used for rat-killing and which are formed on the most delicate model. […] A larger variety of the Bull-terrier was formerly in great request for dislodging foxes from their holes, or “earths,” as their burrows are technically termed; and one or two of these animals were invariably borne on the strength of each pack of foxhounds. There used to be a special strain of these Dogs, named Fox-terriers, which were bred and trained for this purpose alone. The mental powers of this Dog are very considerable, and the animal is capable of performing self-taught feats which argue no small amount of intellect. […] The real Bull-terrier of the first cross is a marvelously brave animal, falling but little short in courage from his bull-dog ancestor, and very far exceeding that animal in agility and intellectual quickness. Fear seems to make no part of a good Bull-terrier’s character; and he dashes with brilliant audacity at any foe which his master may indicate to him, or which he thinks he ought to attack without orders. The quaint-looking SKYE TERRIER has of late years been much affected by all classes of Dog-owners, and for many reasons deserves the popularity which it has obtained. When of pure breed the legs are very short, and the body extremely long in proportion to the length of limb; the neck is powerfully made, but of considerable length, and the head is also rather elongated, so that the total length of the animal is three times as great as its height. The “dew-claws” are wanting in this variety of domestic Dog. The hair is long and straight, falling heavily over the body and limbs, and hanging so thickly upon the face that the eyes and nose are hardly perceptible under their luxuriant covering. The quality of the hair is rather harsh and wiry in the pure-bred Skye Terrier; for the silky texture of the generality of “toy” Skyes is obtained by a cross with the spaniel. It is easy to detect the presence of this cross by the scanty appearance of the hair on the face. The size of this animal is rather small, but it ought not to imitate the minute proportions of many “toy” Dogs. Its weight ought to range from ten to seventeen or eighteen Pounds. Even amongst these animals there are at least two distinct breeds, while some Dog-fanciers establish a third. It is an amusing and clever Dog, and admirably adapted for the companionship of mankind, being faithful arid affectionate in disposition, and as brave as any of its congeners, except that epitome of coin-age, the bull-dog. Sometimes, though not frequently, it is employed for sporting purposes, and is said to pursue that avocation with great credit. Just as the invention of the spinning-jenny abolished the use of distaff and wheel, which were formerly the occupants of every well-ordained English cottage, so the invention of automaton roasting-jacks has destroyed the occupation of the TURNSPIT DOG, and by degrees has almost annihilated its very existence. Here and there a solitary Turnspit may be seen, just as a spinning-wheel or a distaff may be seen in a few isolated cottages; but both the Dog and the implement are exceptions to the general rule, and are only worthy of notice as being curious relics of a bygone time. [...] There are one or two varieties of this Dog, but the true Turnspit breed is now nearly extinct in this country. On the Continent, the spits are still turned by canine labour in localities; but the owners of spit and Dog are not particular about the genealogy of the animal, and press into their service any kind of Dog, provided that it is adequately small and sufficiently amenable to authority. The PUG-DOG is an example of the fluctuating state of fashion and its votaries. Many years ago the Pug was in very great request as a lapdog, or “toy” Dog, as these little animals are more correctly termed. The satirical publications of the last century are full of sarcastic remarks upon Pug-dogs and their owners, and delighted in the easy task of drawing a parallel between the black-visaged, dumpy-muzzled Dog, and the presumed personal attractions of its owner. By degrees, however, this fashion passed away, as is the wont of fashions to do, and, as is equally their wont, has again returned in due course of time, and with renewed impetus. Although, in the interregnum that elapsed between the two periods of the Pug-dog’s ascendancy, it was in very little request, yet in its recent popularity it has acquired so great a conventional value, that a thoroughly well-bred Dog will fetch as much as twenty or thirty pounds, or even more if it be a peculiarly fine specimen. The purity of the breed has been scrupulously preserved by one or two British Dog-fanciers, and to them the Pug-dog is indebted for its present position in the popular esteem. It is a cheerful and amusing companion, and very affectionate in disposition. Sometimes it is apt to be rather snappish to strangers, but this is a fault which is common to all lap-dogs which are not kept in proper order by their possessors. For those who cannot spend much time in the open air it is a more suitable companion than any other Dog, because it can bear the confinement of the house better than any other of the canine species; and, indeed, seems to be as much at home on a carpet as is a canary on the perch of its cage. Moreover, it is almost wholly free from the unpleasant odour with which the canine race is affected. The head of the Pug-dog ought to be round, and its forehead high, with a short, but not a turned-up, nose. The whole of the fore-front of the face, extending to the eyes, and technically termed the “mask,” ought to be of a jetty black, marked clearly on the lighter ground of the face. The line which separates the two tints should be as sharply cut as possible. The tail should curl sharply and tightly round, lying on one side of the hinder quarters, and never standing upon the back. The height of time Pug-dog ought not to exceed fifteen inches, or its weight to be more than ten pounds. The DINGO or WARRAGAL, as it is called by the natives, is an inhabitant of Australia, where it is found in the greatest profusion, being; indeed, a pest of no ordinary character to those colonists who are employed in raising and maintaining large flocks of sheep. The colour of this animal is reddish-brown, sometimes sprinkled with black hairs over the back and ribs, the legs retaining the ordinary ruddy hue. Its muzzle is very sharp, as is generally the case with wild dogs; its ears are sharp, short and erect; its tails is pendent and rather bushy; and its eyes small, cunning and obliquely placed in the head. […] As a general fact, the Dingo is not of a pugnacious character, and would at any time rather run away than fight.